How many ways have you seen people being pulled by their dogs? There are dogs out in front of bicycles, skateboards, Rollerblades, scooters, skis, etc. And don’t they look like a great deal of skill is required and potentially dangerous for the dog as well as the “rider”? Have you heard of the personal stories of crashes and injury? But who can blame us, we have an innate urge to tap into the power of the dog, our favorite domesticated animal friend who has an overflowing enthusiasm and energy. Now, a new way to utilize dog power is available, that solves many of the “danger” issues. It’s called the “dog powered scooter” and its awesome fun. It essentially puts the one with the big brain, the rider, in control of the speed and direction of travel. The key design element that accomplishes this is by placing the dog, not out in front, but actually behind the steering mechanism. This has been accomplished by coupling the dog to our most basic, simple, stable form of the wheel- the scooter. We’ve seen the popularity of the small micro-scooters with the very young to attest to their ease of use and stability. Up scaled scooters for adults have been available but have not grown in popularity due to greater efficiency and practicality of the bicycle. But now enter “dog power” and the equation has shifted. The scooter is the perfect vehicle to motivate with dog power. The center of gravity (with you standing on the footboard) is so low on scooters that its very easy to keep it upright- and if instability is introduced terra firma is only inches away and its easy to step off. But now where to put the dog as an engine? As discussed earlier the dog needs to be subject to the steering forces of the scooter therefore they need to be behind the front steering wheel. For safety and confidence the dog needs to see any obstacles coming along into his path. And through trial and error placing the dog at the side had the least negative effect on the scooter handling- and in fact added width to the system, which aids in stability. (For those with poor balance like very young children or the elderly a third wheel can be added to the “outrigger”) Through continued experimentation a rigid bar and harness configuration was developed to keep the dog in position- limiting side-to-side movement while allowing forward motion. Then it was a simple matter to make the rigid connection to the standard (large wheels, good brakes) scooter. Another great advantage of giving the rider the power of steering is that there is virtually no “training” necessary for the dog. The animal’s only choice is to go forward, no dog needs training to do that! Most confident dogs need just a few minutes in position to acclimatize to the system. And with time learn to actually use the side-to-side restriction as an aid to balance. They also quickly key into the front wheel for turning direction. But mainly they are so “hardwired” into the unit that they “feel” the tug on the harness as soon as the rider begins any directional change and or speed change! Surprisingly the scooter maneuverability is almost unaffected by the dog (they can side step easily) and 90 degree turns are not a problem. Verbal commands are not a necessity and have been relegated to a courtesy! To speed up, the rider “kicks” and tugs forward on the harness. Conversely the dog “feels” the reverse tug on the harness indicating braking. Dogs can easily out brake any scooter and usually are happy and cooperative in braking thus the scooter generally only needs to stop itself. Yet rider judgment is always needed to keep speed down in areas of congestion. Most dogs also quickly give up “fighting” the system and expending unproductive energy in trying to get to other dogs, cats, squirrels, etc. If anything you get a shot of forward energy! Yet the scooter has such great slow speed stability that you can still stand on it and ride even at a dogs walking pace! Yet I don’t want to convey this system is just a toy for human entertainment. It involves a larger body of knowledge about dog care, limitations and teamwork therefore can offer more satisfying rewards. The dog must see this as beneficial to him in some way- namely chance to get exercise, a way to get to a dog park to play, a way to get more rewards in terms of treats and or love & attention. Just like work is to us this should become a source of “pride” for the animal. There are some ways to mitigate the systems impact on the dog in order to keep it fun and safe. First of all you’ll be part of a team and need to help the dog a lot- particularly on the up hills. This is essentially a dog-assisted scooter. The dog will perform better if he gets your participation. I don’t recommend more than a 100 lb. weight difference between the rider and dog. (this is where the lighter women and children have an advantage) Don’t leave your dog in the system for more than 2 miles and or 20 minutes before letting him out for a play break with water available. Cut the activity back dramatically during hot weather. Minimize the time spent on hard pavement. The “outrigger” is recommended attached on the right side so that on a typical sidewalk the dog can run on the grass while you keep the wheels on the pavement. (This also minimizes conflicts or collisions with head on passing of bicycles, dogs, other people) For intensive use (more than 3 outings- 6 miles each per week) on pavement, use the new dog booties with the thick rubber soles. Keep your dog’s claws cut short, allow the dog to set the pace. There will be times when the dog will breakout into a gallop for the thrills you desire, but most of the time he will pace himself at a trot and slow to a walk when needing to recharge. Again stop and rest often and enjoy this great way to spend time traveling with your dog. With a responsible rider and a strong dog this new dog-powered scooter system offers solutions to many of the challenges we face in exercising our dogs in this ever more congested world. 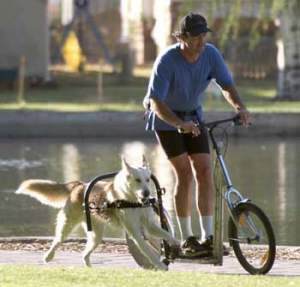 It offers lots of exercise in short period of time, lets the dog go full blast and or walk offering its owner the thrill of dog mushing and an opportunity to participate, maneuverability and control appropriate for the urban environment, all the while keeping the dog completely under control required in our litigious society. If you’re looking for a new sport and a practical tool for transportation for yourself and your furry friend this is it; dog mushing for the common dog and the common owner, during any season.